The ‘Jail of Horror’ & ‘The Paranormal Ghost Hunt’ return for Halloween from Friday 12th October. Can you see the figure on the right hand side at the cell door? 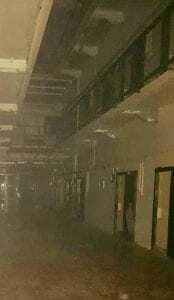 This image was captured by Lori Kelly during a paranormal tour in October 2016. This Halloween, Belfast’s Infamous Prison, Crumlin Road Gaol is unlocking its doors for 3 weeks of intense nail biting tours. Guaranteed to make even the bravest of visitors jump! 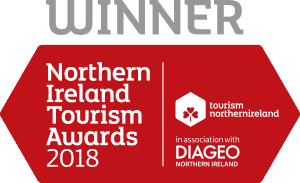 The 5 star visitor attraction will be pulling out all the stops for its eagerly anticipated Halloween programme which will feature the ‘Jail of Horror’ and the ‘Paranormal Ghost Hunt’. Launching on Friday 12th October until Halloween Night, the jail events are the perfect preparation to get your annual fix of all things spooky and paranormal. Each night there will be haunting Halloween experiences to suit both those seeking a heart pounding fear fest, to those seeking a ghostly experience on a haunted prison site which witnessed the execution of 17 men over its 150 year history. How loud will you scream? The Jail of Horror, described as one of Belfast’s most fearsome scare attractions is returning for Halloween 2018. Visitors, if they dare, will enter the off limits dungeon of D Wing and face all their fears on an intense scare after scare journey which only has one way out!! The one-of-a-kind ‘Jail of Horror’ tour through Belfast’s oldest prison will offer a terrifying unparalleled experience. Sightings, noises and unexplained happenings… Are you brave enough to go ghost hunting? Both events start on the 12th October and run up to Halloween on October 31st. All events are ticketed and booking is essential – call 028 9074 1500 or visit www.crumlinroadgaol.com. Please note the Halloween experiences are carried out in low light conditions and flat footwear must be worn. The events are not suitable for young children and if you are scared easily, it may not be for you either!